Holds 2 guitars or a desktop mixer in front and electric guitar in back. 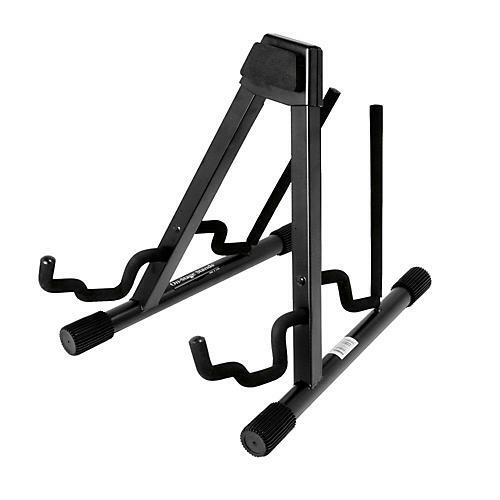 The On-stage Stands Professional Double A-Frame Guitar Stand is a versatile double version of their heavy-duty A-Frame. It features heavy-duty square tubing, velveteen rubber and a "uni-construction" design, which means that there are no parts to lose. A patented stepped yoke holds both acoustic and electric guitars as well as desktop mixers and combo amps in the front and an additional electric guitar in the back. There is no longer a need to own multiple stands when the patented stepped yoke design can hold all of them! A must for the gigging musician. Patented stepped yoke holds both acoustic and electric guitars, as well as desktop mixers and combo amps. Folds flat in seconds for easy storage and travel. 10-degree tilt back angle and splayed foot print make for a stable foundation. Get this versatile stand for your setup on stage or in studio. Order today.